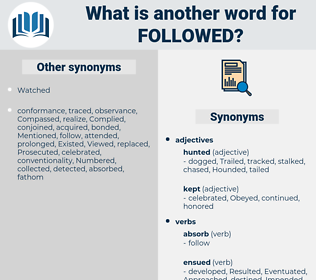 What is another word for Followed? 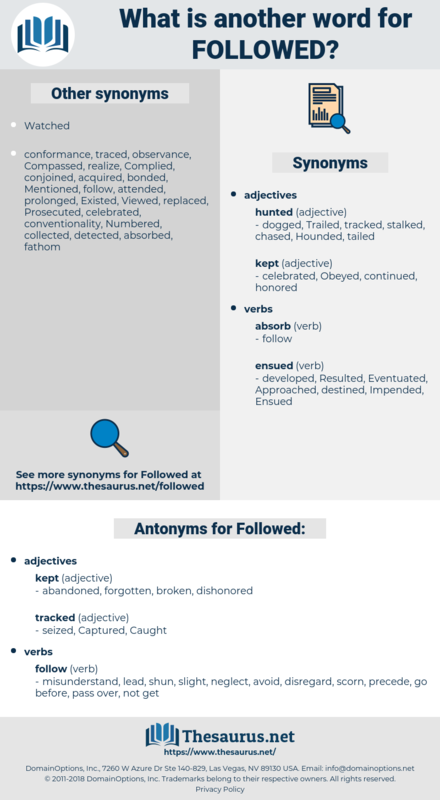 following, follows, observed, applied, continued, Adhered, follow-up, following-up, well-respected, subsequent, follow-through, adherence. Flowed, Forwarded, Complied, implementation, afterwards, forthwith, foilowed, conforming, Conformed, accompanied, adhere, Upheld, Caught, Obeyed, abided, supported, Participated, correspond, Corresponded, enforced, fulfil, fulfilled, Proceeded, Flew, focused, Borrowed, reflected, Investigated, Responded, disregarded, withheld, complement, complemented, adopted, next, guaranteed, Walked, apply, welcomed, Paralleled, Oversaw, showed, promulgated, shadowed, supervised, Listened, preceding, operational, same, Performed, Administered, Resulted, Worked, used, Prosecuted, Heeded, repeated, endorsed, practices, failed, Delivered, Undertook, represented, Discriminated, purpose, backtracked, learned, Commemorated, Chose, Occurred, Was, Were, AM, Persisted, wiretapped, prior, practised, Enjoyed, Embraced, Belonged, maintained, Befell, Offered, contained, violated, ended, Generated, noted, identified, addressed, Underwent, constituted, Encountered, included, proclaimed, Relied, Suffered, joined, celebrated, enrolled, checked, held, suggested, Ensued, concluded, executed, engaged, reproduced, honour, honoured, rules, Supplemented, conducted, left, recalled, utilize, utilized, Introduced, Replied, felt, drew, implied, Reiterated, functional, Stipulated, accepted, Benefited, mirrored, noticed, presented, imposed, experienced, selected, verified, Mentioned, married, marry, location, led, Trailed, dimension, moved, Wore, Commented, read, adapted, Acceded, Slipped, received, approved, concerned, replaced, Stayed, Resorted, Issued, initiated, opted, recorded, inherited, considered, Obtained, lay, Operated, And, Succeeded, Skipped, Yielded, effected, ensured, fell, Carried, Waged, Brought, kept, attended, played, chased, Incurred, pointed, found, hosted, Examined, spent, Recited, added, opposed, Picked, Transpired, Achieved, derived, produced, Lasted, affected, traced, Gave, Arose, paid, Convened, sent, Appealed, place, placed, Took, sought, Told, detected, Emerged, laid, Infringed, Provided, donated, turned, Resumed, reminded, expressed, Had, Became, Detained, behind, faced, items, align, retained, insured, required, Happened, reviewed, trusted, Went, Levied, y, expanded, released, Appeared, tailed, Aimed, Arrived, stemmed, extended, Killed, Voted, Targeted, Enacted, saw, Began, Launched, Sued, tested, Remained, graduated, discharge, under, sighted, Caused, Dealt, granted, Remarked, agreed, Created, fired, assured, Audited, hunted, ET, annum, seminar, Entered, deducted, Bought, Served, heard, amp, Discussed, done, Did, studied, rested, Ranged, amended, venue, tried, secured, Met, Passed, put, said, more, Marched, dark, wanted, intended, charged, raised, Returned, mounted, Dan, struck, na, stated, called, Acted, Ran, Meant, Got, thought, made, observed, named, applied, followed-up, continued, Adhered, follow-up, subsequent, adherence. Forwarded, Complied, implementation, thereafter, Allowed, conformity, operationalized, Conformed, observance, Flouted, accompanied, Upheld, Caught, Furthered, Obeyed, known, abide, abided, Emulated, supported, stopped, Participated, preferred, forgotten, enforced, Progressed, fulfilled, incorporated, Seconded, proceedings, procedure, formulated, ignored, focused, involved, Borrowed, reflected, Investigated, Contravened, Responded, withheld, subscribed, complemented, fulfilment, filled, applies, adopted, reconciled, next, guaranteed, Overseen, demonstrated, characterized, Shown, welcomed, Explored, mainstreamed, Contemplated, continuity, supervised, Preceded, forged, appreciated, Listened, understood, Accommodated, confirmed, elaborated, Performed, stuck, Administered, Resulted, Worked, removed, recovered, used, Prosecuted, compensated, forecast, Heeded, Undertaken, obliged, employed, repeated, governed, Translated, endorsed, Espoused, failed, Delivered, Replicated, Discriminated, transposed, provoked, Prompted, associated, written, offset, Been, accomplished, precedence, bypassed, learned, prolonged, Occurred, Imitated, safeguarded, Favoured, Circumvented, practised, Enjoyed, Embraced, finalized, maintained, Deployed, Offered, organised, pressed, pledged, contained, Undergone, committed, Entailed, allocated, violated, ended, Generated, noted, exposed, jurisdiction, identified, addressed, guide, guided, Indicated, triggered, Compared, Lived, published, interested, persecuted, Invoked, Encountered, included, help, Echoed, apprehended, Perpetrated, Relied, Suffered, joined, enrolled, checked, developed, withdrawn, held, occupied, Inferred, copied, suggested, recourse, renewed, Exercised, coupled, Transferred, concluded, executed, engaged, devoted, ascertained, drawn, Channelled, described, realized, Answered, honoured, Afforded, rules, Submitted, Supplemented, conducted, left, Filed, utilized, Advocated, prescribed, Introduced, Replied, recosted, scheduled, implied, Tackled, valued, Escorted, accepted, Instituted, surrendered, reacted, handled, appointed, Benefited, noticed, presented, imposed, experienced, selected, Mentioned, obligated, routed, utilised, certified, proposed, Managed, chosen, revealed, financed, led, inscribed, Promoted, conserved, Looked, preserved, anticipated, moved, Inspected, built, Borne, Commenced, read, adapted, imported, Acceded, directed, received, realised, approved, concerned, witnessed, replaced, Embarked, perceived, Stayed, measured, Resorted, Issued, initiated, Drafted, regulated, transmitted, insert, Inserted, opted, recorded, specified, traveled, travelled, inherited, Retrieved, reversed, organized, Flagged, protected, considered, Obtained, Operated, Succeeded, calibrated, artwork, entrusted, shared, assumed, Lodged, documented, Yielded, Pushed, inspired, combined, effected, ensured, determined, improved, Carried, Waged, Brought, kept, attended, played, chased, adjusted, dedicated, treated, Incurred, pointed, found, hosted, acquired, Examined, spent, added, listed, opposed, increased, Picked, Enshrined, registered, given, Achieved, elected, Died, stalked, derived, suited, connected, produced, Steered, honored, Displayed, proved, Attracted, Depended, Lagged, mobilised, affected, detached, Fought, Subjected, traced, paid, activated, tabled, Convened, tailored, sent, placed, missed, stored, sought, controlled, posted, Told, detected, driven, Awarded, allotted, turn, elapsed, Emerged, laid, assisted, Urged, Infringed, have, Has, Provided, donated, turned, attained, Resumed, aligned, assigned, Exerted, Had, printed, expected, trained, Detained, Mimicked, faced, underneath, gone, matched, history, retained, insured, breached, required, Happened, Accorded, reviewed, prepared, handed, Ceded, y, Appended, seen, expanded, Begun, released, Appeared, tailed, Aimed, accused, Arrived, impact, hired, extended, admitted, arranged, discharged, Voted, Targeted, Enacted, actioned, Viewed, Exceeded, Launched, educated, Sued, Cared, geared, Remained, graduated, induced, tied, arrested, sighted, Caused, punished, regained, Dealt, granted, sealed, dashed, agreed, Created, attached, linked, assured, inverted, Demanded, Audited, hunted, abused, ranked, traded, accessed, Deemed, Entered, deducted, Emitted, Served, Denied, sold, Compromised, heard, amp, needed, Discussed, Envisaged, Surveyed, done, studied, desired, bound, rested, broken, amended, tried, planned, secured, designed, based, Met, e, Passed, put, started, intended, charged, raised, Returned, backed, decided, marked, 29, mounted, struck, aged, signed, tuned, dead, Reached, ii, stated, cut, run, Acted, Meant, Got, thought, made, observed, applied, continued, Adhered, follow-up, adherence. lead, scorn, precede, not get, misunderstand, pass over, disregard, slight, avoid, shun, go before, neglect. Monica had been here, and she had left a message for me to read if I followed. Jeanne made no reply, but followed her to her own room where Snowball was waiting to dress her. feeble, folly, felly, fall away, foible, falla, fill, fella, foully, fowl, fuel oil, folio, flyaway, fula, fly, flee, flyway, flywheel, fool, filly, Fa La, floe, fable, feel, file away, flow away, flail, fully, flu, fl, fipple, Fal La, folie, felloe, fulah, fuel, Ful, flay, foal, foul, flea, flue, foil, faille, fallal, fail, flaw, filial, fell, file, fool away, full, fallow, fall, fibula, fellow, flow, fille, fellah.